This article is about the maintenance of one's personal well-being and health. For a person's assessment of his/her own value and dignity, see Self-esteem. In health care, self-care is any necessary human regulatory function which is under individual control, deliberate and self-initiated. Some place self-care on a continuum with health care providers at the opposite end to self-care  while others see it in a complex multidimensional construct. In modern medicine, preventive medicine aligns most closely with self-care. A lack of adherence to medical advice and the onset of a mental disorder can make self-care difficult. Self-care is seen as a partial solution to the global rise in health care costs placed on governments. The notion that self-care is a fundamental pillar of health and social care means it is an essential component of a modern health care system governed by regulations and statutes. Self-care is considered a primary form of care for patients with chronic conditions who make many day-to-day decisions, or self-manage, their illness. Self-management is critical and self-management education complements traditional patient education in primary care to support patients to live the best possible quality of life with their chronic condition. Self-care is learned, purposeful and continuous. In philosophy, self-care refers to the care and cultivation of self in a comprehensive sense, focusing in particular on the soul and the knowledge of self. There are a number of self-care requisites applicable to all humans across all ages and necessary to fundamental human needs. For example, as humans we need to intake sufficient air, water and food; care also needs to be taken with the process of elimination and excrement. There must be a balance between rest and activity as well as between solitude and social activities. The prevention and avoidance of human hazards and participation in social groups are also requisites. Maturity requires the autonomous performance of self-care duties. According to the Middle-Range Theory of Self-Care of Chronic Illness, self-care is defined as the process of maintaining health through health promoting practices and managing illness and is performed in both healthy and ill states. Self-care is composed by three dimensions: self-care maintenance, self-care monitoring and self-care management. Factors affecting self-care are: experience and skill, motivation, cultural beliefs and values, confidence, habits, functional and cognitive abilities, support from others, and access to care. Checking blood pressure at home with an electronic sphygmomanometer. Self-care maintenance refers to those behaviors performed to improve well-being, preserve health, or to maintain physical and emotional stability. Self-care maintenance behaviors include illness prevention, illness behaviors, and proper hygiene. Illness prevention measures include tobacco avoidance, exercise, and diet. Tobacco use is the largest preventable cause of death and disease in the US. By avoiding or quitting tobacco use, overall health and quality of life are improved and risk of disease and premature death are reduced. The benefits of regular physical activity may include weight control, reduced risk of chronic disease, strengthened bones and muscles, improved mental health, improved ability to participate in daily activities, and increased chance of living longer. The Center for Disease Control and Prevention (CDC) recommends 2 hours and thirty minutes of moderate activity each week. Examples of this include brisk walking, swimming, dancing, riding a bike, and even jumping rope. Another important aspect to self care includes eating fresh fruits and vegetables, lean meats and other proteins. Processed foods should be limited. Limiting saturated fats, trans fats, sugars, and sodium will also contribute to a healthy diet. Illness behaviors include taking medicines as prescribed and getting vaccinations. When medicines are not taken as prescribed, complications can occur. These complications include disease progression, reduced functional abilities, lower quality of life, and increased hospital visits. Vaccinations helps protect individuals from serious illnesses and complications related to vaccine-preventable diseases like pneumonia. Hygiene is another important part of self-care maintenance. Hygiene behaviors include adequate sleep, regular oral care, and hand washing. Getting 7–8 hours of sleep each night can protect physical and mental health. Sleep deficiency increases the risk of heart disease, kidney disease, high blood pressure, diabetes, and obesity. Sleep deficiency can also lead to depression, suicide, and risk-taking behavior. Teeth brushing and personal hygiene can prevent infection. Self-care maintenance behaviors can be influenced by external factors, such as access to healthcare and living environments. Social determinants of health play a huge role in how people take care of themselves. Access to care is one major determinant of one's ability to carry out self-care maintenance behaviors.This includes having access to transportation to visit a health care service, availability of open hours of offices/clinics, and whether or not the care is affordable. These external factors can determine a person's ability to perform self-care maintenance because a person may not be able to perform a behavior based on its availability. Access to facilities that promote self-care within one's living environment is another factor that influences self-care maintenance. An individual's environment determines whether they are able to go to the gym to exercise or go to a grocery store to buy healthy food. Living in a food desert or having limited resources that allow for physical activity would decrease the likelihood of participating in self-care maintenance behaviors. Internal factors, such as motivation, emotions, and cognitive abilities also influence self-care maintenance behaviors. Motivation is often the driving force behind performing self-care maintenance behaviors. A person who is motivated to stay healthy and managing and/or prevent a chronic illness is more likely to be interested in performing maintenance behaviors, such as those mentioned above. Emotions are also indicative of whether a person is going to perform such behaviors. A person with depression is more likely to have a poor dietary intake low in fruits and vegetables, reduced physical activity, and poor medication adherence. An individual with impaired cognitive or functional abilities also has a diminished ability to performing self-care maintenance behaviors. Some of these behaviors, such as medication adherence, require the ability to maintain a schedule, but someone with memory impairment may have difficulty completing tasks based on memory. Additionally, one's sense of motivation influences an individual's ability to perform self-care behaviors. Individuals need to be able to plan, set goals, and make appropriate decisions regarding their health needs. In addition, self-care is influenced by an individual's attitude and belief in his or her self-efficacy. Having the confidence to perform an action and to overcome barriers is indicative of success in performing self-care behaviors. Cultural beliefs and values may also influence self-care. Self-care may be viewed as highly important in some countries or within certain cultures that value independence, but in other cultures, self-care may contradict their beliefs and values as they strongly promote a hard-working lifestyle. Values have been proved to have en effect on self-care in Type 2 Diabetes Mellitus. Social supports also influence how an individual performs self-care maintenance. Social supports include family, friends, and support groups. Support groups can be through religious groups, groups that manage chronic illnesses, or a community group. These supports can help by having people to talk to or help make decisions about your care. Self care can also help prevent suicide. Individuals who live with chronic illness acknowledge that shared care can help make living with a chronic illness less stressful. The presence of co-morbid conditions makes performing self-care maintenance behaviors harder to complete. As an example, a patient with diabetes would need to exercise, but if they also have COPD they easily develop shortness of breath which would cause them to stop exercising. It is important to address all the symptoms of each chronic illness an individual suffers from so that individuals with chronic illnesses can successfully perform self-care maintenance behaviors. Self-care is also taking care of minor ailments, long term conditions, or one's own health after discharge from secondary and tertiary health care. For instances of neck pain, for example, self-care is the recommended treatment. Patients who are better informed and more educated possess greater motivation for self-care. Individuals conduct self-care and experts and professionals support self-care to enable individuals to undertake enhanced self-care. The recognition and evaluation of symptoms is a key aspect of self-care. The main issues involved with self-care and the onset of illness are medically related such managing drug side effects, emotions and psychological issues, changes to lifestyle and knowledge acquisition to assist in decision-making. Self-care support has crucial enabling value and considerable scope in developing countries with an already overburdened health care system. But it also has an essential role to play in affluent countries where people are becoming more conscious about their health and want to have a greater role in taking care of themselves. To enable people to do enhanced self-care, they can be supported in various ways and by different service providers. Multifaceted interventions that tailor education to the individual are more effective than patient education alone. Approaches used to improve self-care are summarized here. “Teach-back” is used to gauge how much information is retained after patient teaching. Teach-back occurs when patients are asked to repeat information that was given to them. The educator checks for gaps in the patient's understanding, reinforces messages, and creates a collaborative conversation with the patient. It is important for individuals with a chronic illness to comprehend and recall information received about their condition. Teach-back education can both educate patients and assess learning. One example of how a provider can initiate teach-back is by asking, “I want to make sure that I explained everything clearly. If you were talking to your neighbor, what would you tell her/him we talked about today”. This phrase protects the patient's self-esteem while placing responsibility for understanding on both the provider and patient. One study performed showed that patients with heart failure who received teach-back education had a 12% lower readmission rate compared to patients who did not receive teach-back. Although the teach-back method is effective in the short-term, there is little evidence to support its long-term effect. Long-term knowledge retention is crucial for self-care, so further research is needed on this approach. Habits are automatic responses to commonly encountered situations. One example of a habit is hand washing after restroom use. The main characteristic of a habit is automaticity. A habit is formed when environmental cues result in a behavior with very little conscious deliberation. Behavioral economics is a subset of the study of economics that examines how cognitive, social, and emotional factors play in role in an individual's economic decisions. Behavioral economics is now influencing the design of healthcare interventions aimed at improving self-care maintenance. Because humans do not always make rational decisions when it comes to self-care, behavioral economics takes into account the complexity and irrationality of human behavior. Motivational Interviewing is a way to engage people in critically thinking about their self-care needs. MI uses an interviewing style that focuses on the individual's goals and can be used in any context. MI is based on three psychological theories: cognitive dissonance, self-perception, and the transtheoretical model of change. MI is intended to enhance intrinsic motivation for change. Health coaching is another method of promoting motivation to initiate and maintain behavior change. The health coach facilitates behavior change by emphasizing personal goals, life experiences, and values. Self-care monitoring is the process of surveillance that involves measurement and perception of bodily changes, or "body listening". Effective self-care monitoring also requires being able to label and interpret changes in the body as normal or abnormal. Listening to your body and recognizing signs and symptoms, increasing factual knowledge towards disease or illness are all important factors. Being able to interpret and label your symptoms, understanding the process of your disease, and knowing how to act and treat accordingly allows competency in knowing when to seek further medical help. Self-care monitoring consists of both the perception and measurement of symptoms. Symptom perception is the process of monitoring one's body for signs of changing health. This includes body awareness or body listening, recognizing symptoms relevant to health, and interpreting and labeling these symptoms. Changes in health status or body function can be monitored with various tools and technologies. The range and complexity of medical devices used in both hospital and homecare settings are increasing. Certain devices are specific to a common need of a disease process. 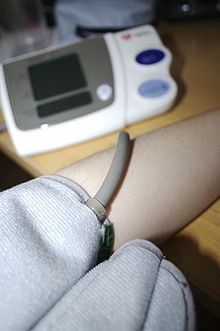 For example, various types of glucose monitors are used by patients with diabetes to track their blood sugar levels. Other devices can provide a more general set of information, such as a weight scale, blood pressure cuff, pulse oximeter, etc. Less technological tools can include organizers, charts, and diagrams to trend or keep track of things such as amount of calories, mood, vital sign measurements, and more. A patient's ability to engage in self-care monitoring greatly impacts the progression of his/her disease. Barriers to monitoring can go unrecognized and end up interfering with effective self-care. Barriers can include knowledge deficits, undesirable self-care regimens, different instructions from multiple providers, and limitations to access related to income or disability. Psychosocial factors such as motivation, anxiety, depression, confidence can also serve as barriers. Cost of equipment – This is a common barrier to self-care monitoring. Certain equipment is needed to monitor symptoms, such as test strips and needles in blood glucose monitoring. The cost of equipment can be expensive for some individuals, so they are less motivated and less likely to keep track of symptoms. Lack of knowledge – With monitoring, it is important to understand what you’re looking for and why you’re doing it. For example, some individuals may not understand the implications of high blood sugars or high blood pressure. Thus, they don’t feel the need to monitor it. Also, if you don’t understand the importance of the monitoring, you will not do it. 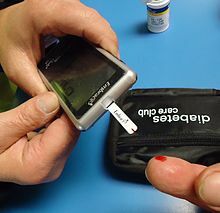 Fear of outcomes/fear of using equipment – In the example of blood glucose monitoring, some people may be afraid of needles, which will deter them from doing fingersticks to read their blood sugar. Other people may have a fear or anxiety of how results may turn out and may avoid them. For example, a person who did not follow a diet to maintain their blood pressure or blood sugar may have a fear that it is already high and thus, does not want to monitor it. Familial/social support (or lack thereof) – Monitoring something implies doing it on a regular/frequent basis. Doing anything consistently sometimes requires reminders or a little encouragement from others. Because self-care monitoring is conducted primarily by patients and their caregivers, it is necessary to work with patients closely on this topic. Providers should assess the current self-care monitoring regimen and build off this to create an individualized plan of care. Knowledge and education specifically designed for the patient's level of understating is central to self-care monitoring. When patients understand the symptoms that correspond with their disease, they can learn to recognize these symptoms early on. Then they can self-manage their disease and prevent complications. Mindfulness: Mindfulness and meditation, when incorporated into a one-day education program for diabetic patients, have been shown to improve diabetic control in a 3-month follow-up in comparison to those who received the education without a focus on mindfulness. Decision-making: How a patient's decision making capacity can be encouraged/improved with the support of their provider, leading to better self-care monitoring and outcomes. Self-efficacy: Self-efficacy has been shown to be more closely linked to a patient's ability to perform self-care than health literacy or knowledge. Wearable technology: How self-care monitoring is evolving with technology like wearable activity monitors. Self-care management is defined as the response to signs and symptoms when they occur. Self-care management involves the evaluation of physical and emotional changes and deciding if these changes need to be addressed. Changes may occur because of illness, treatment, or the environment. Once treatment is done, it needs to be evaluated to judge whether it would be useful to do again in the future. Treatments are based on the signs and symptoms experienced. Treatments are usually specific to the illness. Self-care management includes recognizing symptoms, treating the symptoms, and evaluating the treatment. Self-care management behaviors are symptom- and disease-specific. For example, a patient with asthma may recognize the symptom of shortness of breath. This patient can manage the symptom by using an inhaler and seeing if their breathing improves. A patient with heart failure manages their condition by recognizing symptoms such as swelling and shortness of breath. Self-care management behaviors for heart failure may include taking a water pill, limiting fluid and salt intake, and seeking help from a healthcare provider. Access to care: Access to care is a major barrier affecting self-care management. Treatment of symptoms might require consultation with a healthcare provider. Access to the health-care system is largely influenced by providers. Many people suffering from a chronic illness do not have access to providers within the health-care system for several reasons. Three major barriers to care include: insurance coverage, poor access to services, and being unable to afford costs. Without access to trained health care providers, outcomes are typically worse. Financial constraints: Financial barriers impact self-care management. The majority of insurance coverage is provided by employers. Loss of employment is frequently accompanied by loss of health insurance and inability to afford health care. In patients with diabetes and chronic heart disease, financial barriers are associated with poor access to care, poor quality of care, and vascular disease. As a result, these patients have reduced rates of medical assessments, measurements of Hemoglobin A1C (a marker that assesses blood glucose levels over the last 3 months), cholesterol measurements, eye and foot examinations, diabetes education, and aspirin use. Research has found that people in higher social classes are better at self-care management of chronic conditions. In addition, people with lower levels of education often lack resources to effectively engage in self-management behaviors. Age: Elderly patients are more likely to rate their symptoms differently and delay seeking care longer when they have symptoms. For example, an elderly person with heart failure may experience the symptom of shortness of breath differently than someone with heart failure who is younger. There are many reasons contributing to this difference in symptom experience. Providers should be aware of the potential delay in provider-seeking behavior in elderly patients which could worsen their overall condition. Prior experience: Prior experience contributes to the development of skills in self-care management. Experience helps the patient develop cues and patterns that they can remember and follow, leading to reasonable goals and actions in repeat situations. A patient who has skills in self-management knows what to do during repeated symptomatic events. This could lead to them recognizing their symptoms earlier, and seeking a provider sooner. Health care literacy: Health care literacy is another factor affecting self-care management. Health care literacy is the amount of basic health information people are able to understand. Health care literacy is the major variable contributing to differences in patient ratings of self-management support. Successful self-care involves understanding the meaning of changes in one's body. Individuals who can identify changes in their body are then able to come up with options and decide on a course of action. Health education at the patient's literacy level can increase the patient's ability to problem solve, set goals, and acquire skills in applying practical information. A patient's literacy can also affect their rating of healthcare quality. A poor healthcare experience may cause a patient to avoid returning to that same provider. This creates a delay in acute symptom management. Providers must consider health literacy when designing treatment plans that require self-management skills. Co-morbid conditions: A patient with multiple chronic illnesses may experience compounding effects of their illnesses. This can include worsening of one condition by the symptoms or treatment of another. People tend to prioritize one of their conditions. This limits the self-care management of their other illnesses. One condition may have more noticeable symptoms than others. Or the patient may be more emotionally connected to one illness, for example, the one they have had for a long time. If providers are unaware of the effect of having multiple illnesses, the patient's overall health may fail to improve or worsen as a result of therapeutic efforts. There are many ways for patients and healthcare providers to work together to improve patients and caregivers' self-care management. Stoplight and skill teaching allow patients and providers to work together to develop decision-making strategies. Green is the safe zone, meaning the patient's signs and symptoms are what is typically expected. The patient should continue with their daily self-care tasks, such as taking daily medications and eating a healthy diet. Yellow is the caution zone, meaning the patient's signs and symptoms should be monitored as they are abnormal, but they are not yet dangerous. Some actions may need to be taken in this zone in order to go back to the green zone, for instance taking an additional medication. The patient may need to contact their healthcare team for advice. Red is the danger zone, meaning the patient's signs and symptoms show that something is dangerously wrong. If in this category the patient needs to take actions to return to the green category, such as taking an emergency medication, as well as contact their healthcare team immediately. They may also need to contact emergency medical assistance. The stoplight plan helps patients to make decisions about what actions to take for different signs and symptoms and when to contact their healthcare team with a problem. The patient and their provider will customize certain signs and symptoms that fit in each stoplight category. 2. Skills teaching is a learning opportunity between a healthcare provider and a patient where a patient learns a skill in self-care unique to his or her chronic illness. Some of these skills may be applied to the daily management of the symptoms of a chronic illness. Other skills may be applied when there is an exacerbation of a symptom. The patient should not only learn the purpose of self-care skills. It is also important to learn when to apply skills in daily management of a chronic illness and how the skill might be modified or changed when the patient experiences an exacerbation of a symptom. For example, a patient newly diagnosed with persistent asthma might learn about taking an oral medicine for daily management, control of chronic symptoms and prevention of an asthma attack. However, there may come a time when the patient might be exposed to an environmental trigger or stress that causes an asthma attack. The patient starts to experience shortness of breath, chest tightness or wheezing. When this unexpected symptom occurs, the skill of taking daily medicines and the medicine that is taken may change. Rather than taking an oral medicine daily, a different medication is needed for quick rescue and relief of symptoms. The rescue medication works quickly with an inhaler. Knowing to choose the right medication and knowing how to take the medicine with an inhaler is a skill that is learned for the self-care management of asthma. In skills teaching, it is important for the patient and provider to discuss skills and address any lingering questions. It is important for the patient to know when and how a skill is to be implemented, and how the skill may need to be changed when the symptom is different from normal. See the summary of tactical and situational skills above. Learning self-care management skills for the first time in the care of a chronic illness is not easy, but with patience, practice, persistence and experience, personal mastery of self-care skills can be achieved. Self-care information on health and human body systems, lifestyle and healthy eating. Support to capture, manage, interpret, and report observations of daily living (ODLs), the tracking of trends, and the use of the resulting information as clues for self-care action and decision making. Self-care and self-monitoring devices and assistive technology. Self-care skills and life skills training programmes and courses for people. Advice from licensed counselors, clinical social workers, psychotherapists, pharmacists, physiotherapists and complementary therapists. Self-care support networks which can be face to face or virtual, and made up of peers or people who want to provide support to others or receive support and information from others (including a self-care primer for provider/consumer convergence). 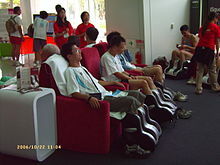 Massage with robotic massage chairs. A lack of self-care in terms of personal health, hygiene and living conditions is referred to as self-neglect. The use of caregivers and Personal Care Assistants may be needed. An aging population is seeking greater self-care knowledge primarily within families connections and with responsibility usually belonging to the mother. Michel Foucault understood the art of living (French art de vivre, Latin ars vivendi) and the care of self (French le souci de soi) to be central to philosophy. The third volume of his three-volume study The History of Sexuality is dedicated to this notion. For Foucault, the notion of care of self (epimeleia heautou) of Ancient Greek and Roman philosophy comprises an attitude towards the self, others and the world, as well as a certain form of attention. For Foucault, the pursuit of the care for one's own well-being also comprises self-knowledge (gnōthi seauton). Around the same time that Foucault developed his notion of care of the self, the notion of self-care as a revolutionary act in the context of social trauma was developed as a social justice practice in Black feminist thought in the US. Notably, civil rights activist and poet Audre Lorde wrote that in the context of multiple oppressions as a black woman, “caring for myself is not self-indulgence, it is self-preservation, and that is an act of political warfare.” With the rise of the term in the medical usages, for instance, to combat anxiety, the association with black feminism has fallen away in clinical and popular usage. However, in feminist and queer theory, the link to Lorde and other scholars is retained. The self-care deficit nursing theory was developed by Dorothea Orem between 1959 and 2001. The positively viewed theory explores the use professional care and an orientation towards resources. Under Orem's model self-care has limits when its possibilities have been exhausted therefore making professional care legitimate. These deficits in self-care are seen as shaping the best role a nurse may provide. There are two phases in Orem's self-care: the investigative and decision-making phase, and the production phase. ^ a b Alexander Segall; Jay Goldstein (1998). "Exploring the Correlates of Self Provided Health Care Behaviour". In Coburn, David; D'Arcy, Alex; Torrance, George Murray (eds.). Health and Canadian Society: Sociological Perspectives. University of Toronto Press. pp. 279–280. ISBN 978-0-8020-8052-3. Retrieved 29 August 2013. ^ a b c Chambers, Ruth; Gill Wakley; Alison Blenkinsopp (2006). Supporting Self Care in Primary Care. Radcliffe Publishing. pp. 15, 101, 105. ISBN 978-1-84619-070-4. Retrieved 29 August 2013. ^ a b c d e f g h i j k l m n o p q r s t u Riegel, Barbara; Jaarsma, Tiny; Strömberg, Anna (2012). "A Middle-Range Theory of Self-Care of Chronic Illness". Advances in Nursing Science. 35 (3): 194–204. doi:10.1097/ANS.0b013e318261b1ba. ISSN 0161-9268. PMID 22739426. ^ Mertig, Rita G. (2012). Nurses' Guide to Teaching Diabetes Self-management. Springer Publishing Company. p. 240. ISBN 978-0-8261-0828-9. Retrieved 30 August 2013. ^ a b Kollack, Ingrid (2006). "The Concept of Self Care". In Kim, Hesook Suzie; Kollak, Ingrid (eds.). Nursing Theories: Conceptual and Philosophical Foundations. Springer Publishing Company. p. 45. ISBN 978-0-8261-4006-7. Retrieved 31 August 2013. ^ a b Bodenheimer, Thomas (20 November 2002). "PAtient self-management of chronic disease in primary care". JAMA. 288 (19): 2469–2475. doi:10.1001/jama.288.19.2469. ISSN 0098-7484. ^ a b c Taylor, Susan G.; Katherine Renpenning; Kathie McLaughlin Renpenning (2011). Self-care Science, Nursing Theory, and Evidence-based Practice. Springer Publishing Company. pp. 39–41. ISBN 978-0-8261-0779-4. Retrieved 25 August 2013. ^ a b Ziguras, Christopher (2013). Self-care: Embodiment, Personal Autonomy and the Shaping of Health Consciousness. Routledge. pp. 14–15. ISBN 978-1-134-41969-2. Retrieved 31 August 2013. ^ a b Riegel, Barbara; Jaarsma, Tiny; Lee, Christopher S.; Strömberg, Anna (19 November 2018). "Integrating Symptoms Into the Middle-Range Theory of Self-Care of Chronic Illness". ANS. Advances in Nursing Science: 1. doi:10.1097/ANS.0000000000000237. ISSN 1550-5014. PMID 30475237. ^ "Self Care Measures | Maintaining Health Through Health Promoting Practices". Retrieved 13 March 2019. ^ Riegel, Barbara; Carlson, Beverly; Moser, Debra K.; Sebern, Marge; Hicks, Frank D.; Roland, Virginia (August 2004). "Psychometric testing of the self-care of heart failure index". Journal of Cardiac Failure. 10 (4): 350–360. doi:10.1016/j.cardfail.2003.12.001. ISSN 1071-9164. PMID 15309704. ^ "Self-Care Heart Failure Index | Self Care Measures". Retrieved 13 March 2019. ^ "Caregiver Contribution Self-Care Heart Failure Index | Self Care Measures". Retrieved 13 March 2019. ^ Dickson, Victoria Vaughan; Lee, Christopher; Yehle, Karen S.; Abel, Willie M.; Riegel, Barbara (September – October 2017). "Psychometric Testing of the Self-care of Hypertension Inventory". The Journal of Cardiovascular Nursing. 32 (5): 431–438. doi:10.1097/JCN.0000000000000364. ISSN 1550-5049. PMID 27631117. ^ "Self-Care of Hypertension Inventory | Self Care Measures". Retrieved 13 March 2019. ^ Ausili, Davide; Barbaranelli, Claudio; Rossi, Emanuela; Rebora, Paola; Fabrizi, Diletta; Coghi, Chiara; Luciani, Michela; Vellone, Ercole; Di Mauro, Stefania (16 October 2017). "Development and psychometric testing of a theory-based tool to measure self-care in diabetes patients: the Self-Care of Diabetes Inventory". BMC Endocrine Disorders. 17 (1): 66. doi:10.1186/s12902-017-0218-y. ISSN 1472-6823. PMC 5644085. PMID 29037177. ^ "Self-Care of Diabetes Inventory | Self Care Measures". Retrieved 13 March 2019. ^ "Caregiver Contribution Self-Care of Diabetes Inventory | Self Care Measures". Retrieved 13 March 2019. ^ Vaughan Dickson, Victoria; Lee, Christopher S.; Yehle, Karen S.; Mola, Ana; Faulkner, Kenneth M.; Riegel, Barbara (February 2017). "Psychometric Testing of the Self-Care of Coronary Heart Disease Inventory (SC-CHDI)". Research in Nursing & Health. 40 (1): 15–22. doi:10.1002/nur.21755. ISSN 1098-240X. PMID 27686630. ^ "Self-Care of Coronary Heart Disease Inventory | Self Care Measures". Retrieved 13 March 2019. ^ Riegel, Barbara; Barbaranelli, Claudio; Sethares, Kristen A.; Daus, Marguerite; Moser, Debra K.; Miller, Jennifer L.; Haedtke, Christine A.; Feinberg, Jodi L.; Lee, Solim (October 2018). "Development and initial testing of the self-care of chronic illness inventory". Journal of Advanced Nursing. 74 (10): 2465–2476. doi:10.1111/jan.13775. ISSN 1365-2648. PMID 29943401. ^ "Self-Care of Chronic Illness Inventory | Self Care Measures". Retrieved 13 March 2019. ^ a b "Tobacco use". Healthy People. Office of Disease Prevention and Health Promotion. Retrieved 13 April 2017. 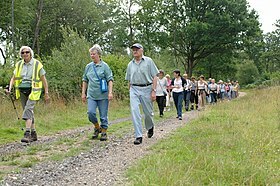 ^ "Physical activity and health". Centers for Disease Control and Prevention. Retrieved 13 April 2017. ^ Jimmy, B; Jose, J (2011). "Patient medication adherence: Measures in daily practice". Oman Medical Journal. 26 (3): 155–159. doi:10.5001/omj.2011.38. PMC 3191684. PMID 22043406. ^ "Importance of vaccines". The Immunization Action Coalition. Retrieved 13 April 2017. ^ a b "Why is sleep important". National Heart, Lung, and Blood Institute. Retrieved 13 April 2017. ^ a b Havranek, E.P. ; Mujahid, M.S. ; Barr, D.A. (2015). "Social determinants of risk and outcomes for cardiovascular disease: A scientific statement from the American Heart Association". Circulation. 132 (9): 873–898. doi:10.1161/CIR.0000000000000228. PMID 26240271. ^ Gonzalez, J.S. ; Safren, S.A.; Cagliero, E. (2007). "Depression, self-care, and medication adherence in type 2 diabetes". American Diabetes Association. 30 (9): 2222–2227. doi:10.2337/dc07-0158. PMC 4440862. PMID 17536067. ^ Luciani, Michela; Rebora, Paola; Rossi, Emanuela; Tonoli, Luca; Androni, Silvia; Ballerini, Enrico; Fabrizi, Diletta; Riegel, Barbara; Ausili, Davide (18 January 2019). "How Do Basic Human Values Affect Self-Care of Type 2 Diabetes Patients? A Multicentre Observational Study". Clinical Nursing Research: 1054773818825003. doi:10.1177/1054773818825003. ISSN 1552-3799. PMID 30658535. ^ a b Bayliss, E.A. ; Steiner, J.F. ; Fernald, D.H.; Crane, L.A.; Main, D.S. (2003). "Descriptions of barriers to self-care by persons with comorbid chronic diseases". Annals of Family Medicine. 1 (1): 15–21. doi:10.1370/afm.4. PMC 1466563. PMID 15043175. ^ "Most Neck Pain Improves with Self-care, Time". HeathCanal. 12 August 2013. Retrieved 31 August 2013. ^ Palo Stoller, Eleanor (1998). Ory, Marcia G.; DeFriese, Gordon H. (eds.). Self-care in Later Life: Research, Program, and Policy Issues. Springer Publishing Company. pp. 24–25. ISBN 978-0-8261-9695-8. Retrieved 28 August 2013. ^ "Politically Active? 4 Tips for Incorporating Self-Care, US News". US News. 27 February 2017. Retrieved 5 March 2017. ^ Blickem, C; Power, P; Protheroe, J; Kennedy, A; Vassilev, I; Sanders, C; Kirk, S; Chew-Graham, C; Rogers, A (2010). "The role of information in supporting self-care in vascular conditions: A conceptual and empirical review". Health and Social Care in the Community. 19 (5): 449–459. doi:10.1111/j.1365-2524.2010.00975.x. PMID 21158998. ^ a b White, M; Garbez, R; Carroll, M; Brinker, E; Howie-Esquivel, J (2013). "Is "teach-back" associated with knowledge retention and hospital readmission in hospitalized heart failure patients?". Journal of Cardiovascular Nursing. 28 (2): 137–146. doi:10.1097/jcn.0b013e31824987bd. PMID 22580624. ^ a b Peter, D; Robinson, P; Jordan, M; Lawrence, S; Casey, K.J. ; Salas-Lopez, D (2015). "Reducing readmissions using teach-back: Enhancing patient and family education". Journal of Nursing Administration. 45 (1): 35–42. doi:10.1097/NNA.0000000000000155. PMID 25479173. ^ Kandula, N.R. ; Malli, T; Zei, C.P. ; Larsen, E; Baker, D.W. (2011). "Literacy and retention of information after a multimedia diabetes education program and teach-back". Journal of Health Communication. 16: 89–202. doi:10.1080/10810730.2011.604382. PMID 21951245. ^ Judah, G; Gardner, B; Aunger, R (2012). "Forming a flossing habit: An exploratory study of the psychological determinants of habit formation". The British Journal of Health Psychology. 18 (2): 338–353. doi:10.1111/j.2044-8287.2012.02086.x. PMID 22989272. ^ Matjasko, J.L. ; Cawley, J.H. ; Baker-Goering, M.M. ; Yokum, D.V. (2016). "Applying behavioral economics to public health policy: Illustrative examples and promising directions". American Journal of Preventive Medicine. 50 (5 Suppl 1): S13–9. doi:10.1016/j.amepre.2016.02.007. PMC 4871624. PMID 27102853. ^ a b Simmons, L.A.; Wolever, R.Q. (2013). "Integrative health coaching and motivational interviewing: Synergistic approaches to behavior change in healthcare". Global Advances in Health and Medicine. 24: 28–35. ^ Olson, S (2010). The role of human factors in home health care. National Academies Press. ^ a b Dickson, V (2011). "A qualitative meta-analysis of heart failure self-care practices among individuals with multiple comorbid conditions". Journal of Cardiac Failure. 17 (5): 413–419. doi:10.1016/j.cardfail.2010.11.011. PMID 21549299. ^ a b c Chua, Siew-Siang; Ong, Woon May; Ng, Chirk Jenn (15 February 2014). "Barriers and facilitators to self-monitoring of blood glucose in people with type 2 diabetes using insulin: a qualitative study". Patient Preference and Adherence. 8: 237–46. doi:10.2147/ppa.s57567. PMC 3931581. PMID 24627628. ^ Woda, A (2015). "Factors influencing self-care behaviors of African Americans with heart failure: A photovoice project". Heart & Lung: The Journal of Acute and Critical Care. 44 (1): 33–38. doi:10.1016/j.hrtlng.2014.09.001. PMID 25444769. ^ Wilde, Mary H.; Garvin, Suzanne (1 February 2007). "A concept analysis of self-monitoring". Journal of Advanced Nursing. 57 (3): 339–350. doi:10.1111/j.1365-2648.2006.04089.x. ISSN 1365-2648. PMID 17233653. ^ Gregg, Jennifer A.; Callaghan, Glenn M.; Hayes, Steven C.; Glenn-Lawson, June L. (2007). "Improving diabetes self-management through acceptance, mindfulness, and values: A randomized controlled trial". Journal of Consulting and Clinical Psychology. 75 (2): 336–343. doi:10.1037/0022-006x.75.2.336. PMID 17469891. ^ Bratzke, L (2015). "Self-management priority setting and decision-making in adults with multimorbidity: A narrative review of literature". International Journal of Nursing Studies. 52 (3): 744–55. doi:10.1016/j.ijnurstu.2014.10.010. PMC 4315694. PMID 25468131. ^ Chen, Aleda M. H.; Yehle, Karen S.; Albert, Nancy M.; Ferraro, Kenneth F.; Mason, Holly L.; Murawski, Matthew M.; Plake, Kimberly S. (1 March 2014). "Relationships between health literacy and heart failure knowledge, self-efficacy, and self-care adherence". Research in Social & Administrative Pharmacy: RSAP. 10 (2): 378–386. doi:10.1016/j.sapharm.2013.07.001. ISSN 1934-8150. PMC 3923851. PMID 23953756. ^ Chiauzzi, Emil; Rodarte, Carlos; DasMahapatra, Pronabesh (9 April 2015). "Patient-centered activity monitoring in the self-management of chronic health conditions". BMC Medicine. 13: 77. doi:10.1186/s12916-015-0319-2. ISSN 1741-7015. PMC 4391303. PMID 25889598. ^ a b c d Lee, KS; Lennie, TA; Dunbar, SB; Pressler, SJ; Heo, S; Song, EK; Biddle, MJ; Moser, DK (2015). "The association between regular symptom monitoring and self-care management in patients with heart failure". Journal of Cardiovascular Nursing. 30 (2): 145–151. doi:10.1097/JCN.0000000000000128. PMC 4098015. PMID 24434828. ^ Kaptein, AA; Fischer, MJ; Scharloo, M (2014). "Self-management in patients with COPD: theoretical context, content, outcomes, and integration into clinical car". International Journal of Chronic Obstructive Pulmonary Disease. 9: 907–917. ^ DeVoe, J.E; Baaez, A; Angier, H; Krois, L; Edlund, C; Carney, P.A (2007). "Insurance + access ≠ health care: typology of barriers to health care access to low-income families". Annals of Family Medicine. 5 (6): 511–518. doi:10.1370/afm.748. PMC 2094032. PMID 18025488. ^ Parikh, P.B. ; et al. (2014). "The impact of financial barriers on access to care, quality of care and vascular morbidity among patients with diabetes and coronary heart disease". Journal of General Internal Medicine. 29 (1): 76–81. doi:10.1007/s11606-013-2635-6. PMC 3889957. PMID 24078406. ^ Cramm, J.M; Nieboer, A.P (2012). "Self-management abilities, physical health and depressive symptoms among patients with cardiovascular diseases, chronic obstructive pulmonary disease, and diabetes". Patient Education and Counseling. 87 (3): 411–415. doi:10.1016/j.pec.2011.12.006. PMID 22222024. ^ Lam, C; Smeltzer, S.C (2013). "Patterns of symptom recognition, interpretation, and response in heart failure patients: An integrative review". Journal of Cardiovascular Nursing. 28 (4): 348–359. doi:10.1097/jcn.0b013e3182531cf7. PMID 22580629. ^ a b Wallace, A.S; Carlson, J.R; Malone, R.M; Joyner, J; DeWalt, D.A (2010). "The influence of literacy on patient-reported experiences of diabetes self-management support". Nursing Research. 59 (5): 356–363. doi:10.1097/nnr.0b013e3181ef3025. PMC 2946184. PMID 20808193. ^ a b Bayliss, E.A; Steiner, J.F; Fernald, D.H; Crane, L.A; Main, D.S (2003). "Descriptions of barriers to self-care by persons with comorbid chronic diseases". Annals of Family Medicine. 1 (1): 15–21. doi:10.1370/afm.4. PMC 1466563. PMID 15043175. ^ Bennett, H. D., Coleman, E. A., Parry, C., Bodenheimer, T., & Chen, E. H. (2009). Health coaching for patients with chronic illness. Family practice management, 17(5), 24-29. ^ Dickson, Victoria Vaughan; Riegel, Barbara (May 2009). "Are we teaching what patients need to know? Building skills in heart failure self-care". Heart & Lung: The Journal of Acute and Critical Care. 38 (3): 253–261. doi:10.1016/j.hrtlng.2008.12.001. PMID 19486796. ^ "Seeking Curiosity: How Embracing Uncertainty Strengthens Empathy". 11 July 2017. Retrieved 20 December 2017. ^ "じっくり選ぶ結婚指輪の効果とは – 家内の希望で購入した結婚指輪のおかげで今でも夫婦円満です。". www.informationprescription.info. Retrieved 20 December 2017. ^ "Website of the Foundation for Assistive Technology". Retrieved 20 December 2017. ^ Dominic Tyer (28 August 2013). "UK preparing self-care portal for patients". PMLive. PMGroup Worldwide Ltd. Retrieved 31 August 2013. ^ 18.Foucault M: Technologies of the Self. Amherst: University of Massachusetts Press; 1988. As cited by: Thomas J. Papadimos; Joanna E. Manos, Stuart J. Murray (2013). "An extrapolation of Foucault's Technologies of the Self to effect positive transformation in the intensivist as teacher and mentor". Philosophy, Ethics, and Humanities in Medicine. 8 (7). doi:10.1186/1747-5341-8-7. ^ Meltzer, Marisa (10 December 2016). "Soak, Steam, Spritz: It's All Self-Care". The New York Times. ^ Radical self-care : Performance, activism, and queer people of color (Thesis). May 2014. ^ Laurin, Jacqualine (1994). "Commentary". In Kikuchi, June F.; Simmons, Helen (eds.). Developing a Philosophy of Nursing. Sage. p. 27. ISBN 978-0-8039-5423-6. Retrieved 31 August 2013.